Xiaomi's recently launched MIUI 7 BETA is now available for selected Xiaomi handsets. 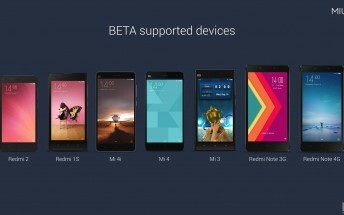 Mostly the Beta software is available for newly released and Xiaomi's high-end smartphones. Find your luck here are the Xiaomi's devices to get MIUI 7. Xiaomi Mi 4i, Redmi 1S, Redmi 2, Mi 4, Mi 3, Redmi Note 3G and Redmi Note 4G. Get the download link at the end of the article. According to Android Authority the MIUI 7 comes with a few new features. Those features includes customizable Themes, processor and battery optimization. These are the new features which MIUI brings. Xiaomi MIUI 7 ROM - Click here.